Corporate Image’s Casino Parties are ideal for Fund Raisers, Company Parties, Conventions, Reunions, & Private Parties. 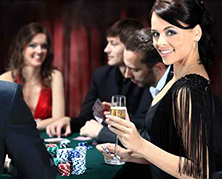 A Casino Party is an event that is as fun and exciting as a real casino without the risk of losing. It is a popular theme for fund raisers, company parties, conventions, reunions, and private parties. 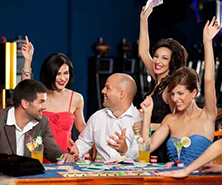 Guests receive fun money vouchers which they exchange for chips to play with at the casino tables. At the end of the event prizes can be offered and are awarded to the winners based on the value of the casino chips accumulated. Alternatively, prizes can be auctioned to the players for their casino chips, offering a great entertainment value. The most popular method of distributing the prizes is to have the guests purchase raffle tickets with their chips and have a ‘drawing’ for the prizes. Guests can play Texas Hold’em Poker, Three Card Poker, Let it Ride Poker, Caribbean Stud Poker, Money Wheel, War, Cash Cube, Blackjack, Craps, Roulette or Slot Machines. We also offer the ‘Race Night’ Derby Party and Texas Hold’em Poker Tournaments. All you supply are the players, the place and the prizes, and Corporate Image will supply the rest. Our full-service packages include all casino quality gaming tables and supplies, our friendly professional dealers, delivery and set-up to your location, and tear down. See our lighted casino tables and decor. Our staff is well trained to handle the most avid casino players along with teaching the inexperienced ones the rules and procedures of all of the games. At the end of the event, we want your guests (as well as your boss, client, and co-workers) to tell YOU what a GOOD JOB YOU DID organizing the casino production. You don’t need to let them know that you arranged it all with just one call to Corporate Image, and we did all the work.